�Horse,� said Jonathan Trent as I stepped into his office. Horse is my name, although I am not, in fact, a horse. Most of the time. I nodded and sat down, perching awkwardly on the human-sized chair. I knew that. Everyone knew that. I smiled a little less faintly. Those jobs were always the most fun. Jonathan Trent inhaled. �You will receive eighty silver,� he finished. I nodded, stood, and left. Despite his status, Fang�s office was small, situated on the third floor of a nondescript Newton office building along with many other small, nondescript offices. I wouldn�t be able to sneak in until night-fall, so instead of heading south, out of Old Town and into Newton, I headed north, across the canals and to the Scarlet Cathedral. It was a beautiful building on the outside, with white spires shining brightly in the late-morning sun. The blood-red banners of the cult of the Scarlet Resurrection fluttered up its length, and a beautiful fountain flowed in the square in front. The square was one of the few well-kept areas of Old Town. The rest � the stagnant canals and the narrow, tightly-winding medieval streets � had all long ago fallen into sullen disrepair. Broad-shouldered, dour-faced, well-armed Scarlet guards paced the square. A pair flanked the wide marble stairs that led up from the fountain to the Cathedral�s wide, wooden doors. Making as little eye contact with anyone as possible, I marched up the stairs, between the guards, and through the doorway. In the narthex stood a massive ledger, beside a red-robed man with an ornate hourglass around his neck. �Out of what will true power be born?� said the official stiffly. �From the harnessing of chaos,� I answered dutifully. It was the first question of the Chaos Line, and my knowledge of it signified my membership in the Resurrection. I�d been an initiate for a year now, having been hired on as paid labor a few days after my arrival in the city three years earlier. The cult�s pretensions � the strict hierarchies, and the Chaos Line with its ten apocalyptic questions � were sometimes almost too much to bear, but being a member meant protection, and better pay for the little jobs they sent me on, so I played gamely along. �Have you understood the nature of the Resurrection?� said the man. �This question is beyond me,� I replied dutifully. After all, I was only an initiate. The red-robed man, middle-aged and clean-shaven, nodded, so I stepped forward and scratched my name in the open ledger. The man seized the pen from me, and, glancing down at his hourglass, scribed the time next to my mark. Inside the nave, nearly everything was black: the pews, the tapestries which hung on the walls and covered the original white stonework, the stonework patterns inlaid into the floor. The panes of the high stained-glass windows had been almost entirely replaced with black, and what translucent glass remained was red. The Resurrection�s initiates were expected to spend six hours a week sitting in the Cathedral�s back-most pews, staring up at the dour stained glass figures, or at whatever religious goings-on were taking place at the far-off altar, and contemplating the infinite abyss and our absolutely, incomprehensibly miniscule place in it. Occasionally, a higher-level Abbot would march up to you and intone some mystical and wise-sounding verse or other, or he�d ask you what you were contemplating and then tell you why it was wrong. Usually, I just sat and contemplated food, or my cat, or my friends. Sometimes, though rarely, I contemplated my life. Almost never did I contemplate the Chaos Line, and the single one of its ten questions which I was permitted to know. Today, there were a dozen other initiates seated in our back-most pews. I squeezed in beside them. After a few moments, my closest neighbor, a young human named Penelope who I knew in passing, leaned over to me. �Have you heard?� she whispered to me. I raised a bushy eyebrow at her. �About the Tooth?� I whispered back. Everyone knew about that. �No,� she said, and was about to explain, but a sudden guilty look overcame her face and she folded her hands silently. I turned, and a stern-looking Abbot was marching towards us. �The route to power is paved with meekness in the face of power,� rumbled the Abbot under his breath, �and the mark of the meek is silence. State your name,� he whispered at me. �My name is Initiate Horse,� I replied dutifully. I glanced up at him, eyebrows raised. The sixth question, so I�d learned, had been answered a hundred and fifty years ago. I�d thought that it was all made-up, that the questions were for show and would never be answered. �Our time of ascension nears,� whispered the abbot. He turned on his heel and marched back down the aisle. �Just three more questions until the end of the world,� I whispered to Penelope, smirking. Penelope, who fervently believed what she was told to believe, furrowed her brow at me. Another initiate, a young dwarf whose name I didn�t know, hissed at us to be quiet. The sun sank behind the rows of ugly, modern-brick Newton buildings, and the evening foot-traffic slowed to a trickle. I was off Scarlet turf, so I kept my eyes open for potential enemies � any shifty-eyed or belligerent clumps of people, or anything clad all in yellow � as I strolled casually up to the front door of Fang the Tooth�s office building and tested the knob. It was locked. I walked heavily into the dark alley behind it, trying not to look like I was sneaking but wishing that my hooves didn�t echo quite so much on the cobblestones. The back service-door was locked as well. Behind a pile of rancid garbage cans, I knelt. I glanced around, holding my breath, looking for curious eyes in the windows and listening for footsteps, but no one was watching and no one approached. I put my big, three-fingered hands on the ground and closed my eyes. Rapidly, inch by inch, from my hooves to the tip of my ears, my mind played over the whole of my body, pulling and prodding, squeezing and shrinking, working subtle magics whose nature I did not wholly understand, until I stood, four soft paws on the cold ground, a large, scruffy, sneaky savannah cat. With a twitch of my long counterweight of a tail, I coiled my cat body. I leapt lithely up, from the ground to the first floor�s narrow window ledges, then quickly up to the second floor�s wider ones. I glanced quickly down at the alley and the street lamps beyond, just to be safe. I didn�t much like heights. I turned my head towards the window. I could barely make out my dim reflection: a pair of horns, leftovers from my natural shape, jutted sideways and then forward from the sides of my cat head, inescapable testament to my cat form�s imperfection. I hissed at it. Then, eyes squeezed shut and breath held tight, I reversed my transformation, and, forcing myself to look anywhere but down, I crossed my fingers and pushed up on the window. It slid open. I grinned. I crept in and then out of whoever�s dull office I had entered. Fang�s office was on the third floor, and I moved down the hall towards the building�s dimly-lit stairwell. It was a long hallway with flickering lights and offices on either side, where probably nothing more exciting than an affair with a secretary had taken place for years. One door stood out: a dusty sign hung over it in the hallway, no extravagant color on it or pictures: just the words �Fang, Public Tooth� scrawled on it in something that looked like dried blood but surely wasn�t. The door itself was the half-wood half-window kind, and inside was dark. I reached for the knob, belatedly wondering how I was going to get in, but it was unlocked. That�s weird, I thought. I eased the door open and hunched through the annoyingly human-sized doorway. Of course it was human-sized: everything on this continent was. I eased the door shut behind me, then pawed about at knee-level for a switch. I found it. I jumped, and my heart hammered against the inside of my chest. Thoughts flashed through my mind � I should have been more careful, and, of course I�m not the only one that�s going to be checking out the Tooth�s abandoned office � but then I turned, and, sitting behind his desk, lounging in his office chair as though he lived in a different world from rumors and rumors, sat Fang the murloc, a cigar clamped in his toothy mouth. He was smaller than I expected. Shock stilled my thoughts for a moment, but after a couple of breaths I recovered enough to say, �Yeah,� and reach into my pocket. For a terrified moment I thought I might not have one, but then my big hands closed over a matchbook I�d stolen from a diner a few nights earlier. If the Tooth of Storm City asked you for a light, you didn�t want to come up short. I handed it to him, and he lit his cigar. �Thanksss,� he hissed. The room�s white walls were bare, except for a round, painted portrait of the murloc himself hanging over the stone fireplace. It was framed in an ornate gold frame, which on closer inspection appeared to be a carved dragon biting its own tail. The opposite wall had a half-emptied bookshelf, most of whose tomes had titles in languages I couldn�t read. There was the desk, boring wood and completely bare, and an uncomfortable-looking chair in front of it and a high-backed leather chair behind it, and Fang the Godhead of the Law, blowing smoke rings out his blue gills and staring up at me. 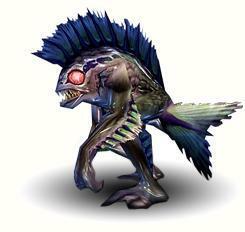 I�d seen him before, but only from afar, and I�d never seen a murloc up close in my life. The row of deep-blue dorsal fins that ran up his back and over the top of his head flipped of their own accord. Without warning, a snake, green with blue stripes and with a pair of tiny, ugly, useless wings sticking out halfway along its body, slithered onto his lap. He stroked it absent-mindedly. �Uh, my name�s Horse,� I said, trying not to stare at the snake, my mind blanking on anything better to do than introduce myself. Never heard that one before. �I�m a bull, thanks,� I said. The murloc puffed at his cigar and looked intently up at me. �You disappeared,� I said thickly. Fang laughed, and it was an unpleasant, half-breathing, half-hissing sort of noise. �If the Law no longer had need of my services, I wouldn�t be here,� he said. �I�d be dead.� The snake slithered up and curled itself around the murloc�s arm. I swallowed. I cocked my head, frowning. Hadn�t Jonathan Trent had me sent here? And he�d made it sound like I�d been his choice. �You need my help?� I said stupidly. �Well, actually,� and the murloc leaned forward, �need might be a bit strong of a word. For now let�s say that we would greatly appreciate it.� He blinked, translucent membranes sliding in sideways from the corners of his red eyes. I shivered involuntarily. �I don�t get to know why, do I,� I said. �Nope,� said the murloc. Not to overstate it. My bovine eyes widened in surprise, then uncertain fear. I�d landed in Storm City three years ago, stowed away on a goblin airship, fugitive from cunning enemies to whom I owed a substantial debt. I felt my nose grow cold. I nodded, and backed towards the door. I reached around behind me for the doorknob.